These offenders are revealed by the servicemen of the State Border Guard Service and are not allowed to enter Ukraine in all directions like by sea, road and air communication. 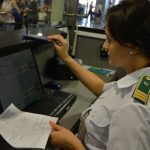 Thus, the border guards of a Separate checkpoint “Kiev” in the “Boryspil” did not let 8 potential illegal migrants across the border. The passengers, citizens of India, arrived by flight from Delhi. However, according to the results of the border control, on the basis of Par. 4 Article 8 (not a proof of purpose of intended stay on the territory of Ukraine) of the Law of Ukraine “On border control”, they have been denied crossing the state border of Ukraine. Identified Indian citizens were returned by a back flight. This entry was posted in Translated Media-News from Ukraine on November 18, 2018 by oksana.